Now that Hilary Mantel has again won the Man Booker prize, perhaps we should wonder whether one of the past Lords of the Manor of Campden would have known Thomas Cromwell. It is far more likely than not that Sir Thomas Smyth did! Thomas Cromwell entered the King’s service in 1530 following the fall of Wolsey, and has been described as the guiding hand behind the Reformation. His appointment to various offices ended with his creation as Earl of Essex in1540 but his fall from favour resulted in his execution in the same year. Thomas Smyth at this time was a Page of the Chamber at the court of Henry VIII; this involved far more than is today thought of as the duties of a page. He accompanied the King in 1520 to the meeting with Francois I at the Field of the Cloth of Gold in France, and on another visit to Calais in 1532, and was present at the taking of Boulogne in 1544. He would have seen and most probably have been known by most of the King’s court and others. He is said to have been a descendant of an alderman of Worcester and could well have known something of this manor, then divided into two. In about 1534 he married a widow, Elizabeth, who was the heiress to half the manor of Campden. Up to that time for a century or so the holders of parts of the manor appear to have tended to live elsewhere and to leave the running of the estates in the hands of bailiffs. This was to change. Any opportunity to buy other parts of the manor was seized. In November 1544 he bought the greater part of the estate of Christopher Savage, including two woods, part of a close and, importantly from his point of view, the entitlement to the rents of the town, the manor leet and view of frankpledge. Thus he took control of the running of much of the manor. It could be that this was not pleasing to the local burgesses who had become used to running things themselves. On more than one occasion in 1544 and 1545 Thomas Bonner prevented Smyth’s cattle from entering the common pasture of the New Leasows. Twice the bailiffs ruled in favour of Smyth but on the third occasion in June 1545 Bonner produced a writ ordering that the cattle be handed over to him. Shortly thereafter Bonner found himself arraigned before the Court of Star Chamber accused of forging the writ. Over the next few years more than five other Campden men also found themselves taken to Star Chamber after attempting to thwart Smyth. He was also adding to his domains by buying up chantry lands and any other pieces that could be obtained. Soon the manor was reunited. His London connections were no doubt also of use when he obtained copies of ancient charters and documents outlining the powers of the Lord of the Manor. In 1553 he was granted Combe (once held by Bordesley Abbey) for £540. 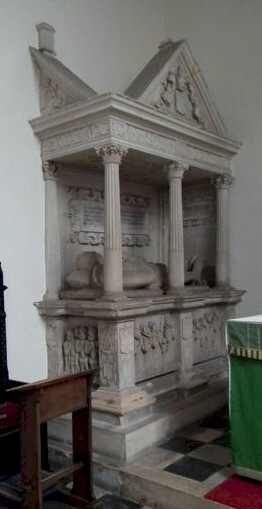 His monument in the chancel of St James’s church is that of a contented Lord of the Manor, who had pretty well achieved his aim of reuniting a broken up manor and had imposed his will on the Town Burgesses. He died in 1593 at another of his properties, at Ocle in Herefordshire.